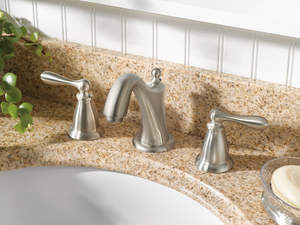 NORTH OLMSTED, OH--(Marketwire - October 1, 2010) - When it comes to product design, Moen is in tune with homeowners' wants and needs... and keeping the finish on kitchen and bathroom faucets free of fingerprints and water spots is a key concern. To solve this problem, Moen introduces Brushed Nickel and Stainless finishes with Spot Resist™ to help homeowners spend more time enjoying their homes... and less time cleaning them. For more information on Spot Resist finish from Moen, visit www.moen.com/spot-resist. Moen offers a diverse selection of thoughtfully designed, on-trend kitchen faucets, bathroom faucets, showerheads, bathroom accessories and stainless steel sinks for residential and commercial applications. As the #1 faucet brand in North America, customers have come to rely on Moen to deliver dependable products and service. Moen is part of Fortune Brands, Inc. (NYSE: FO) (www.fortunebrands.com), a leading consumer brands company. Spot Resist finish from Moen does just what it says -- resists fingerprints and water spots -- to maintain the brilliance of faucets or showerheads.